This day in London history: on 5 January 1840, there were 95,820 licensed public houses accounted for in England. In 1841 there were 15.9 million people in the country, so that’s roughly one pub for every 165 man, woman, and child. By way of contrast, in 2010 there were approximately 52,000 pubs in all of the UK for an estimated 62.3 million people, or close to 1,200 men, woman, and children fighting for entry to each pub. As now (though these figures are stark confirmation of the fact that the local pub is becoming an endangered species), the tavern was an important part of early London life and commerce, and many of their names, as well as the names of other types of business, live on in the street names of the city. 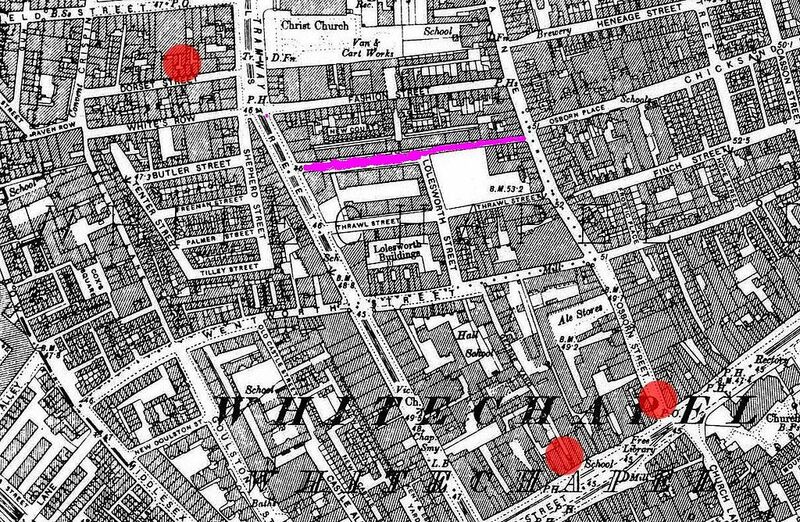 So today, street names from taverns include, among many others, Adam and Eve Mews, Bleeding Heart Yard, Cat and Mutton Bridge, Dog and Duck Yard, Elephant and Castle, Fox and Knot Street, Green Dragon Court, Haunch of Venison Yard, Man in Moon Passage, Nags Head Court, Panyer Alley, Shoulder of Mutton Alley, and World’s End Passage. World’s End Passage takes its name from an old tavern, located at the far end of Chelsea, and approachable only by very bad roads. The sign was a common one for those inns that were the last ones on the outskirts of a town, and subsequently had reputations ranging from dubious to evil. This particular tavern was especially popular during the reign of Charles II. As an inn sign, it provided a challenge for sign painters: in 1825 the sign depicted “a fractured globe on a dark background, with fire and smoke bursting through its rents”. Sometimes it was represented by a horse rearing over the edge of a flat earth, or by a couple together with the line: “I’ll go with my friend to the world’s end”. Shops (including brothels), as well as taverns were often identified by a painted sign for the benefit of the not-so-literate could identify the nature of a business or the name of an inn. Signs were often given nicknames that reflected public opinion on the merits, or at least representational accuracy, of the painter. For instance, one proud shopkeeper had a sign painted, showing a human leg with a garter and a star (possibly to reflect the fact that he had received the Order of the Garter). To his chagrin it was not long before he discovered that his sign was referred to as the Leg and Star. Another common change in signs was the Swan and Harp, which was generally reduced to the Goose and Gridiron, and then became a sign in its own right. There was once a Goose and Gridiron (though this name is considered to be a corruption, or parody, on the arms of the Swan and Lyre, a musical society) near St Paul’s, where a feast was held in 1717 to commemorate the first Grand Lodge of Freemasons.